Building a Business Catalog of services and effective portfolio management requires an understanding of how the business serves external customers. In June's web cast, we'll see some of the techniques used in the Customer Expectation Management method, and how you can apply outside-in thinking to establish a business a lane for your ITSM Road Map. 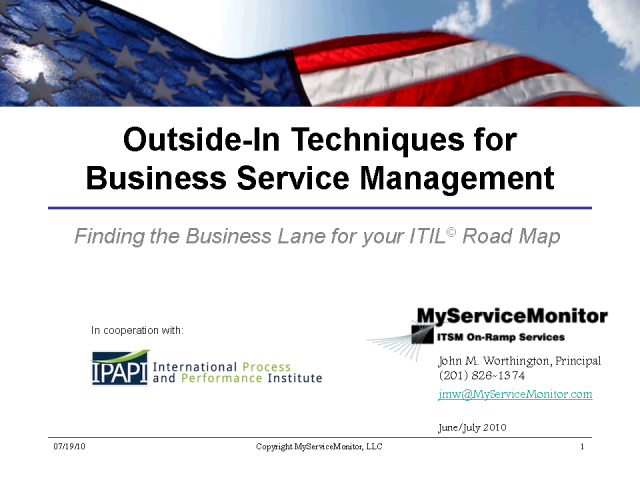 While ITIL mentions the Service Portfolio as the 'spine' that connects each of the service lifecycles there's not a lot of prescriptive guidance on portfolio management in the OGC publications. This month I'll take us through a tour of an upcoming book called Taming Change with Portfolio Management, that offers some interesting advice on this important subject. Tune in to hear what I thought or go to www.tamingchange.com to get your own copy. A lot more questions than answers in the clouds right now. This month's web cast is more of a 15 minute rant than anything, but it should give you some food for thought if you're dreaming about clouds. How can you make sure you're not cloud dog food? Once you've been through the cloud hype, get back to the basics like focusing on external customers and accelerating IT transformation activities. Collaborative management can help. Performance monitoring software is rapidly evolving to include end-to-end, end user experience and application performance management capabilities; but installing intelligent monitoring software is not the same as implementing service monitoring intelligence throughout an IT organization. As the scope of new service monitoring software evolves, using traditional software installation techniques may not be adequate. While investments in management software can provide rapid ROI, the full value of investments (VOI) in these solutions can be elusive. This webinar will discuss the impacts of scope and intangible benefits on the business case for today's IT infrastructure performance monitoring software. This channel focuses (for the most part) on how IT infrastructure performance monitoring and management can be an enabler of ITSM adoption. It is part of logging the savage journey on a road to IT service management excellence... once a month for 30 minutes.